Why direct visual system is required? When we are treating the patient with radiation for any type of cancer first, the target localization setup physically over the skin is important. After finishing the setup definitely no one will stay inside during the treatment to watch and correct the patient movements. Because of that direct visual monitoring system was introduced at the time of Deep X – ray treatment. Later on it was introduced in Telecobalt machines also for the patient monitoring system. Figure:1 The diagram showing the direct visual system of Theratron Telecobalt machine in Dr. B.Borooah Cancer Institute,India. 1. To monitor the patient during the treatment. 2. To find the emergency situation of patient during the treatment. 3. It is cost effective, rather than placing the costly monitoring systems. 1. Though, it is a cost effective system a person is necessary to watch the patient directly. All the time it is not possible to watch it. 2. Individual persons are required to monitor the patients during the treatment. 3. As we are aware of the properties of Radiation (Gamma, x-ray, Proton, Electron, etc.) it can penetrate through the thicker barrier also. 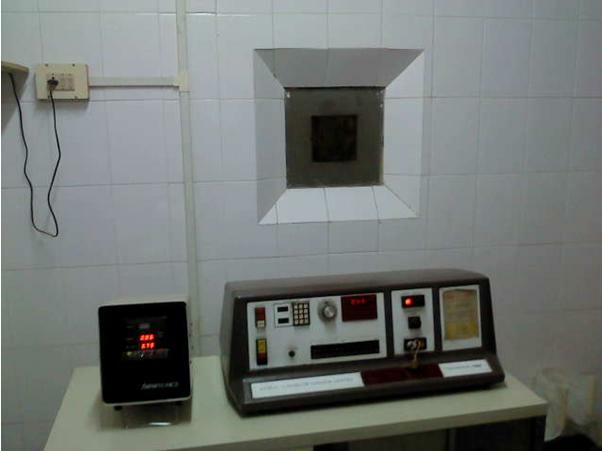 By using the lead glass type window for patient monitoring system, will have chances of exposure to radiation workers in the control console more. Besides, very costly than other latest patient monitoring system and also risky in the future. The above trade-off’s in using the direct visual systems lead to change in the latest patient monitoring systems like Closed Circuit Television (CCTV) etc. in the field of radiotherapy. 1. Why direct visual system required? a) To call the patient to come out after finishing the treatment. 1. Images taken from the Dr. Bhubaneswar Borooah Cancer Institute, India.